Your independent neighborhood barbershop serving Utica and Shelby Township. Conveniently located one block north of Hall Road on Van Dyke Avenue. Steve and Duke's has been servicing Macomb County families for over 50 years! 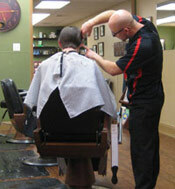 We have four friendly barbers on staff to provide quality hair cuts and shaves! No appointment is needed, we accept only walk-ins. 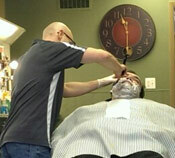 We have four friendly barbers on staff to provide quality hair cuts and shaves. A Tradition of Customer ServiceSteve and Duke’s continue the long tradition of classic barbershopsproviding great customer service without the gimmicks of discount hair salons. At our shop, you will be greeted by one of our four barbers and if you are a regular, you’ll probably be greeted by name. We not only retain our long-time customers, but we make new customers daily by word-of-mouth. Once you visit us, you’ll quickly realize what makes Steve and Duke’s unique– a dedication to providing quality hair-care by a well-trained and friendly staff. 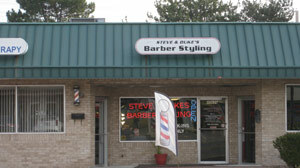 Since its beginning in the mid 1950s, Steve & Duke’s has prided itself on providing families quality haircuts. Although ownership has changed over the years, Macomb County families continue the tradition their parents and grandparents started. This place is what every barbershop should be like. It’s right off Van Dyke, the people are nice, prices are affordable and you get the best service. I especially like the old razor blade and warm shaving cream. These days it’s hard to come by with a place that will actually give you a shave or trim your beard. I never go anyplace except here." For your convenience, we have extended hours on Wednesday night.